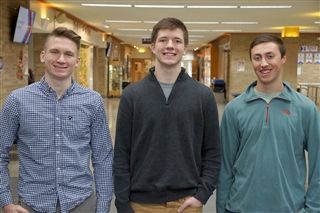 At the pep rally this Friday, January 25, one of three nominated senior boys will be crowned as the 2019 Festival King. Pictured from left to right: Jack Olson, David Frey, and Garrett Pomeroy. They will be escorted by Emily Lohr, Mikayla Oertel, and Mikaela Sullivan.